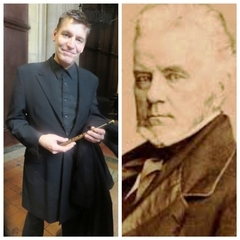 The essence of all the American music heard in this week’s series of concerts in the Cathedral of St. John The Divine is in that key phrase from William Billings’ essay above: “...to a set of rules which I have carved out for myself”. Where the 18th Century British had traditions and cathedrals and churches and royal/aristocratic audiences, Americans–or rather, British subjects soon to become Americans–were musically on their own. Ships bringing Puritans and Pilgrims and adventurers and slaves and bondspeople, had no room for organs or pianofortes–and certainly no space for composers or even music teachers. Thus composers like William Billings–a genius by anybody’s standards–as well as Daniel Read and the other composers produced by Early Music New York this week arose like Botticelli’s Venus from the waves. They pursued their crafts (Billings was a tanner, Daniel Read owned a General Store in New Haven) with time to pursue their arts. 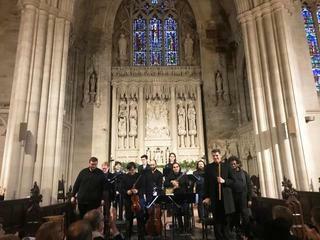 And the results, certainly as showed by Early Music New York, were, as a whole, stunning. Yes, some of the tunes played here were hornpipes and gigues from the Mother Country. And the deep south lived on English music (just as they read Sir Walter Scott rather than James Fenimore Cooper). But the anthology produced in Saint James Chapel this week showed an invention as unique to America as...well, as the Idea of America itself. The ensemble, now in its fifth decade, was an excellent one: spare but hardly minimal. The group was led by fiddler Daniel Lee (actually a superb Baroque violinist who allowed his sounds to be harder, more pressured than usual) and flutist Christopher Layer, with fife and various wooden flutes. The two played solo or antiphonally, backed by guitar, cello and sometimes drum. Not a sumptuous Jordi Savall-style ensemble, but obviously in keeping with New England thrift! When one thinks “18th Century antiphonal”, one thinks of the Gabriellis or Thomas Tallis in the great Baroque churches. This music, though, was composed for country churches, for village schools. The side-chapel here gave greater voice than any of the original meeting halls, yet this hardly altered the musical effect. The choral group was small–but it resounded. And it whispered. And in the closely-composed harmonies of the time, with little counterpoint to blur the words, the tunes (for that was what they were) of Early Music New York was stalwart and yes, hardy. “Hardy” in fact were the keystones of the music. The words were liturgical (“As shepherds in Jewry were guarding their sheep...”), but the emotions were straightforward, the adorations were lively. Redemption was an opposition of loud and soft, with an echo effect after “A God is born, the valleys cry: a God is born, the hills reply”. The chorus included a counter-tenor, but democratic New England had few solos, the closest here a descant in Cradle Song. And while the list of songs (one dare not call them hymns) listed above was voluminous, and while the choral rhythms were rat-a-tat-tat in meter, each song had a different lyrical originality. Some were familiar, like Adeste Fidelis, the others were new but certainly accessible. This may have been the first Billings-accented concert which didn’t include his famous Chester, yet his other melodies played their part. Not a single one had the twists and turns and eccentricities or miraculous joys of a G.F. Handel. At the same time, not a single one imitated those pallid chamber compositions of Thomas Jefferson. After all, he was a Suth-ah-nah, so tried to emulate his Europeans forebears. In essence, this was the equivalent of those 300-year-old ceramics and pictures in any New England antique-shop. The art was plain, direct, harmonious. The songs were elegant, yes, but less the elegance of a cotillion ball than a daughter in a milliner’s shop. And songs of patriotism were less jingoistic than melodies of exuberance, vitality and–like their churchy cousins–filled with the heartiest spirit.